Update: Please see comments, Charles House will not be closed! Great news. 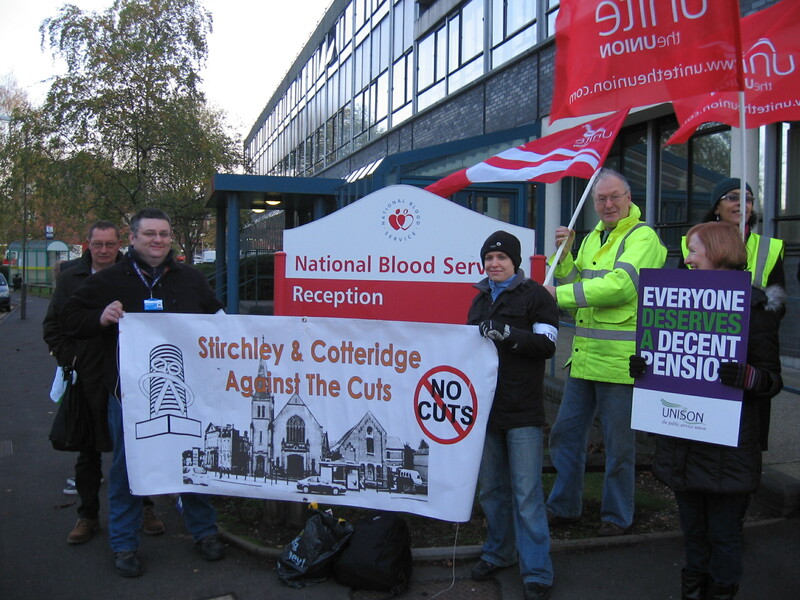 On Saturday, parents and children from Charles House, crowded into the surgery of Kings Norton Councillor Steve Bedser (Lab), accompanied by Stirchley and Cotteridge against the Cuts. After a long meeting, the attendees were very pleased to hear that Steve Bedser pledged to give full public support to the campaign, at ward and Council level. 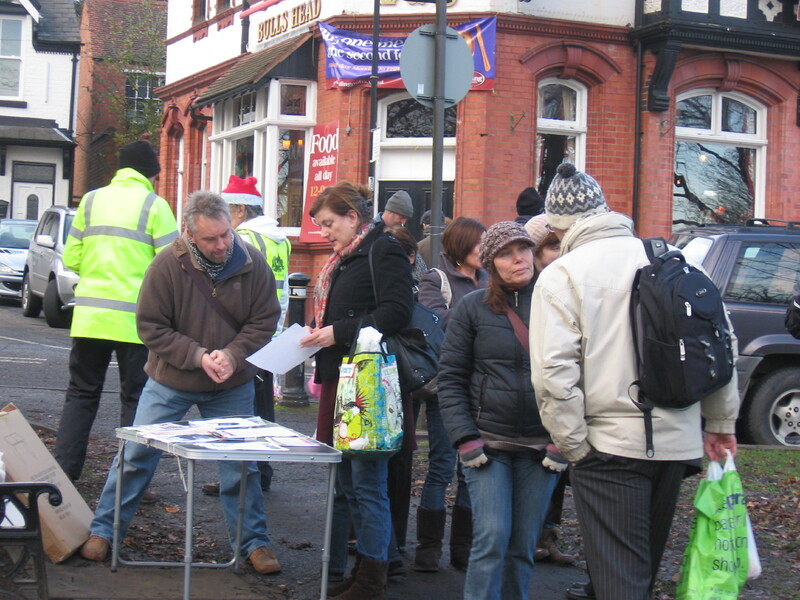 Following the meeting, we all trooped out to do over an hour’s street stall activity on Kings Norton Green. As usual, there was often a queue of people ready to sign the ever-growing petition, and some of the passers-by were even considering coming to the social on Thursday. This all followed a meeting with Councillor Les Lawrence the previous day, where he seemed to have appeased the parents a little as he told them to think positive (suggesting a positive result for them?) and promised a decision by January 10th. He made the right noises, saying that respite care provision was important. He also acknowledged that Charles House children are not suitable for respite care with foster carers. However, a word of caution; similar reassuring noises were heard from Councillor Lawrence about Merrishaw Community Day Nursery earlier this year. There were allegations of scaremongering. Two other Tory councillors from Northfield then gave their backing to the nursery, but the the shutters suddenly went up and the toys were shipped out. 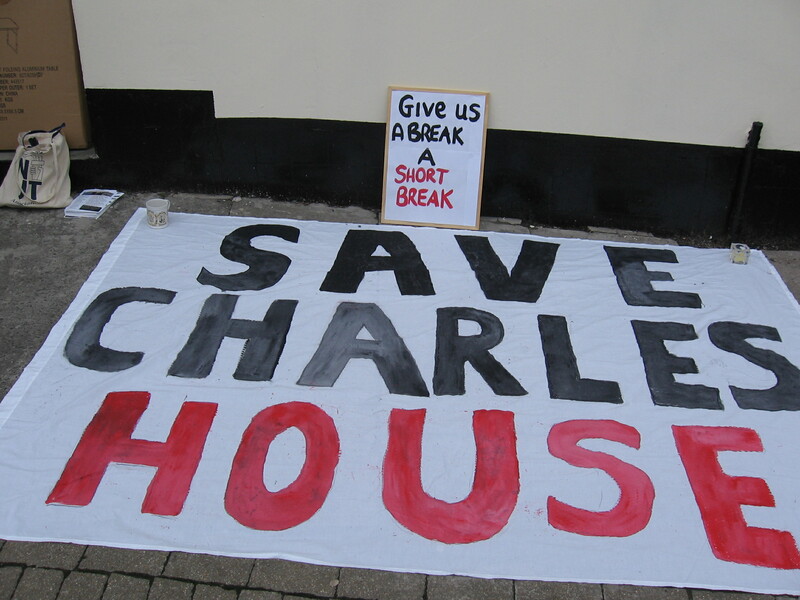 The campaign to save Charles House will not rest until its future, with a full level of resourcing, is in black and white. 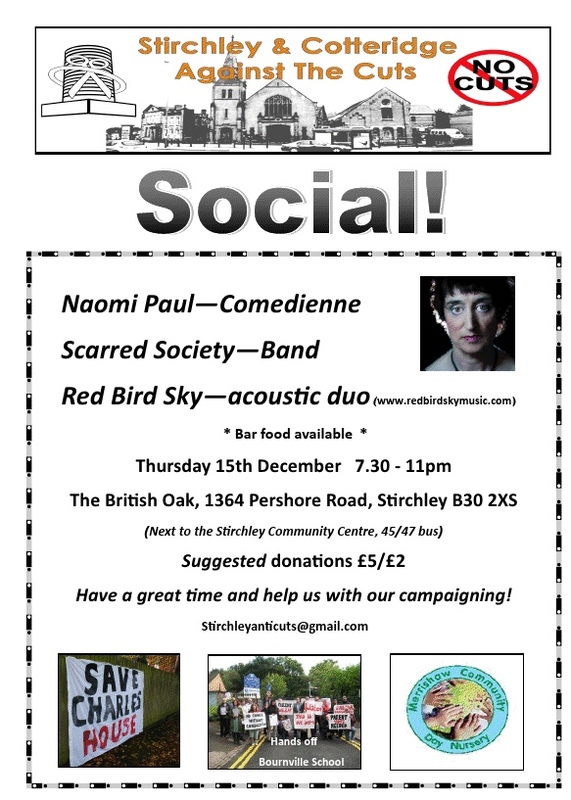 The next planning meeting of SACAC is this Wednesday, 6.15pm at the Stirchley Community Church, (canteen), Hazelwell St. Stirchley. 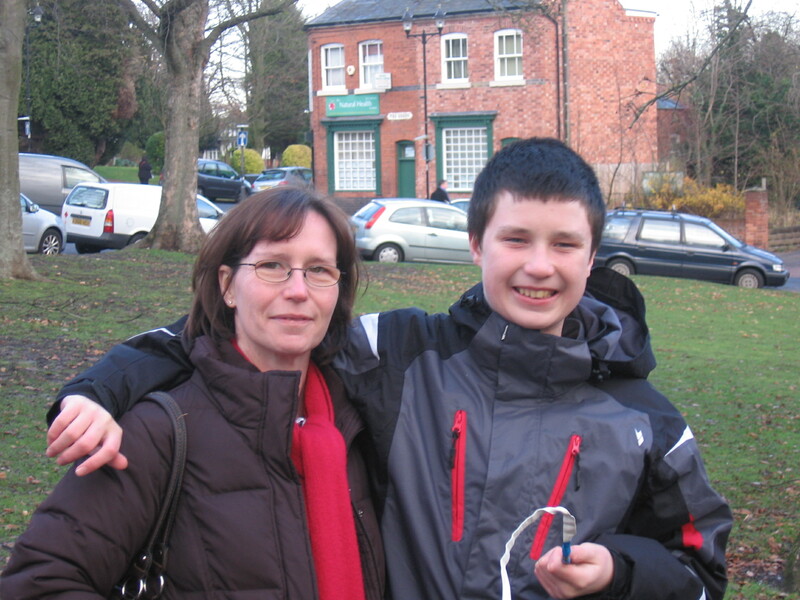 You can read more about the campaign to save Charles House on B31 Voices, including testimonies from parents, or in our own archive of posts. If you want to get involved with the campaign, can email charleshouseparents@gmail.com or join their facebook group. There is also a campaign to save Cambourne House, a similar disabled childrens’ respite home in Aston, who have a facebook group. Save Charles House campaign will hand in the petition against its possible closure to the council during their meeting tomorrow. Councillor Andy Cartwright will submit the petition to the council meeting on behalf of the campaign and it would be great for people to be there when it happens. B31 Voices has been following the campaign closely and has organised the petition. You can read more about Charles House and find parents’ testimonies of the service there. In addition to Charles House, 4 other homes face closure. Cambourne House in Aston has a parents campaign, if you use the service or want to help them, email us at BirminghamAgainstTheCuts@Gmail.com and we’ll put you in contact. If you are a parent or staff member at one of the other homes, we would encourage you to put together a campaign. With enough pressure we can make the council reconsider their plans entirely. We can help you to advertise the campaign and support you with ideas and experience. A packed emergency meeting of parents and supporters was held yesterday at Charles House. This is based in West Heath and provides respite care for disabled children, including such things as autism. It takes children from all parts of the city and provides expert, quality care. The meeting was addressed by the Council official responsible for such provision, Eleanor Brazil (Director CYPF), who explained that “savings” (cuts) were behind the threat to this Council service. She said its occupancy rate was only 57% and that was similar to another home in the city. Foster care might be an alternative. When it came to question time for parents, a host of heartfelt, angry and tearful comments were made. It was stressed time and time again that without the respite care being delivered by Charles House, parents would not be able to cope. It would lead to family breakdowns, which would then cost the state even more. Most parents said that they had found it very difficult to get their children into the house for respite care; it was time consuming and bureaucratic. If it was made easier and more transparent, the take up rate would very quickly climb to 100%. As regards to fostering care, one parent said that she had been turned down by eighteen potential foster parents because they didn’t have the skills needed to look after her child. At Charles House they do have those skills! Incidentally Birmngham City Council wants to cut at least 23 Fostering Social Workers currently based at Lifford House! No, the whole proposal to close or merge Charles House is misconceived nonsense. It should be kept open in its own right with a full level of provision. In reply to the economic argument, the Council is spending £200 million this year in repayments to the banks, via the government. As it was the banks that caused the economic problems behind all of this in the first place, let them wait for their money! The Council has also spent £186 million on Capita. What is the Council getting for this, and is it more important than respite care for disabled children and parents? 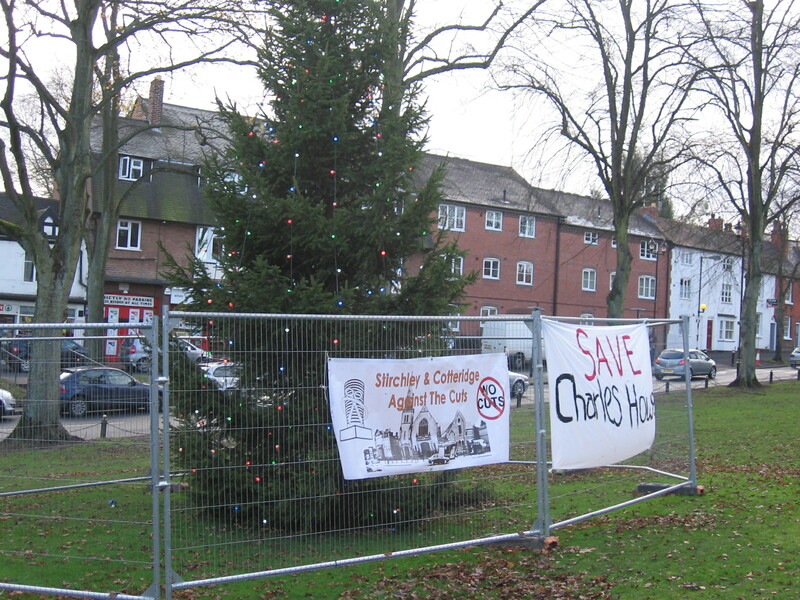 There was huge support expressed for a campaign to save Charles House by the parents. 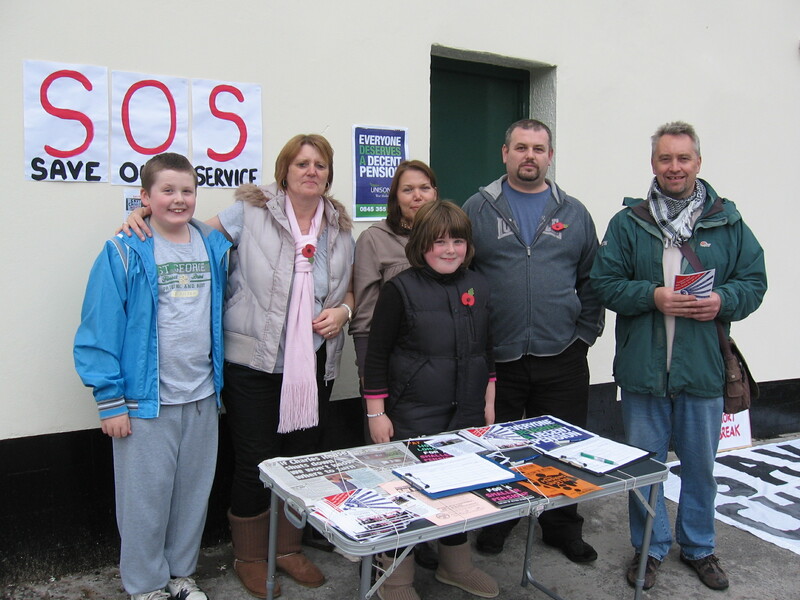 Several Labour (current and potential) Councillors were there to offer support. 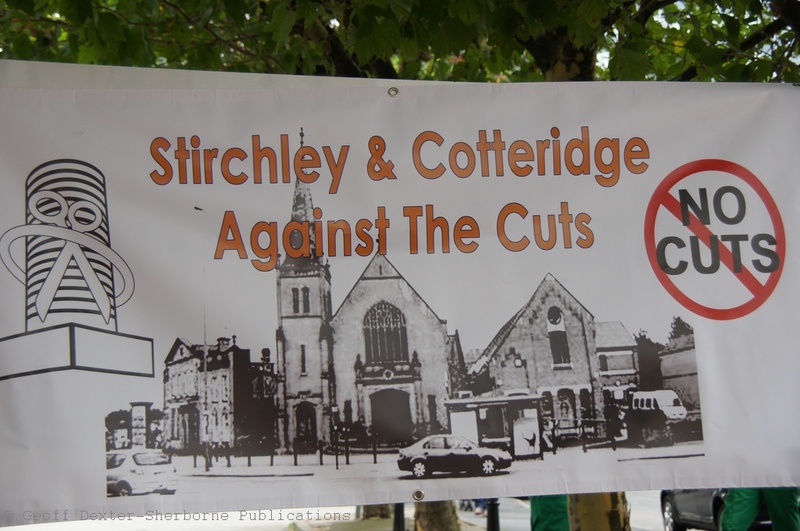 And so were Stirchley and Cotteridge against the Cuts, who pointed out the lessons of the Merrishaw closure and offered a few ideas on how to win this time. The “consultation”period ends on 6th January 2012. There is now a large breathing space to build up such a campaign, that this vital resource will be left alone. There will be a “Save Charles House” group meeting. Next Thursday at 10.30am, 10th November, At Charles House.